Click Here to see our CX-3s! We sell a lot of cars, and in their own way, they are all unique, special, and worthy of praise. However, there is something about the CX-3 that makes it special. There is some ethereal trait that makes it stand out from the crowd even when it’s just sitting there. Maybe it’s the sleek design that was if the stories are to be believed, crafted out of clay first with every ridge and line handmade before being sent to mass production. Maybe it’s because it was designed to look like a wild animal the instant before it pounces? That’s true by the way, but who knows. Maybe it’s just a cool car that you’d look really good in, but there’s really only one way to find out if this search for a Mazda CX-3 near Baden is right for you, and that’s to come in and take it for a test drive! We are located at 115 Northfield Drive W in Waterloo just a short jaunt from where you are right now, or you can give us a call at (519) 746-2777 to book your appointment! Don’t sleep on this one, it’s a special car that will serve you very well! While, yes, the Mazda CX-3 most certainly does have a genuinely unique frame, and yes it is aerodynamically perfect, but what else does it bring to the table? Well, standard in nearly every CX-3 sold at our dealership near Baden is the incredibly powerful halogen headlights and daytime running lights. They look amazing and also warn people when you are gracing the darkened streets with your presence. Which is good because with an engine performing this well it can be a little bit quiet, so they help let people know you’re coming. It also comes with available chrome accents and front grille colours. When it’s this cool you can be a little vain. Inside, the CX-3 has everything you could ever want in a vehicle in a package that screams sophistication to any who will listen. From Bluetooth enabled audio and calling, to a 7” colour touchscreen display giving you everything from car information to available navigation, you are driving the future to and from work every day. This doesn’t even take into account the convenience of the standard rearview camera or the incredibly flashy and available rain-sensing wipers. Your friends won’t even know what to do with all their jealousy. Interested? Visit us near Baden today! If you are looking for your next Mazda CX-3 then you probably care a great deal about safety features. Well, you’ve come to the right place because the CX-3 has a lot of them. To name a few, it comes with standard rear cross traffic alert that tells you where surrounding cars are as you back out, and it also has standard airbags that surround the entirety of the inside of the cabin. These are just the very tip of the iceberg, which the CX-3’s stability control systems could help you climb if it was necessary. The Best Place to Find a Mazda CX-3! When it comes to Mazda CX-3s, there are very few dealerships better qualified than the incredible team at Forbes Waterloo Mazda. 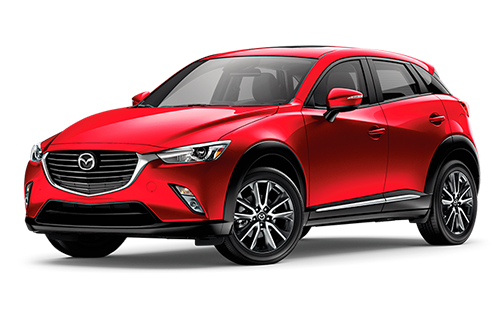 Just a short jaunt from where you are right now, we are the area experts on all things Mazda, and we have just the CX-3 for you. So come see us and cut through the legwork required in buying a new car, let us set you up with something that you are genuinely going to be happy with for a very long time!